First , we visit Istanbul is the only city in the world which embraces two continents, one arm reaching out into Asia, the other into Europe. The museum, churches, places, mosques and bazaars and the sight of natural beauty seem inexhaustible. As you recline on the shores of the Bosphorus at sunset contemplating the red evening light reflected in the windows and on the slender minarets on the opposite shore you understand, suddenly and profoundly, why so many centuries ago settlers chose to build on this remarkable site. 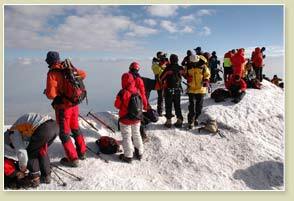 Then 6 days will be on Mt.Ararat Eastern part of Turkey near Iran border and it is a magnificent sprawling dome whose snow covered summit is 5.165m above sea level. Most Christians believe it is the site where Noah’s Ark came to rest after the great Flood. A climb of Mt.Ararat is a tough walk (non-Technical) but requiring a good deal of stamina. The upper third of volcanic covered in snow and the last hundred meters to the summit is icy. Meet the group at the airport and accommodate to the hotel. Afternoon will be spent to discover the uniqueness of old Istanbul. Our first stop is Sultanahmet Mosque (Blue Mosque) is more familiarly known as Blue Mosque because its interior gleams with a magnificent panelling of blue. it was built by architect Mehmet between 1609 and 1616. After visiting we stroll around Ancient Hippodrome the scene of chariot races and the centre of Byzantine civil life, stood in the open space in front of the Blue Mosque. We continue the visit Covered Bazaar is the world largest covered market. this labyrinth of the streets and passages houses more than 4.000 shops. Covered bazaar is still commercial centre of the old city. Overnight hotel. on the east coast of Van lake and its ancient name is Tooshpa; the Urartian capital of Tuspa. Van Lake is the largest lake in Turkey. We drive to Dogubeyazit that is close to the Iranian border and famous with Ishakpasa Palace. We visit Ishakpasa Palace Ottoman governor Ishakpasa constructed the palace in 17th century with a mixture of architectural styles. The palace was made by using red clay stones and it resembles the Topkapi and Edirne Palace. Overnight hotel in Dogubeyazit . In the morning transfer till Eli village. Today We begin our first trek to Mt. 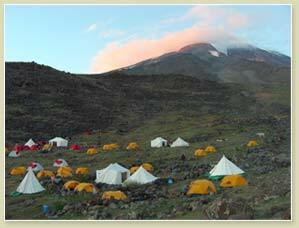 Ararat, we wear our trekking shoes and trek to the base camp at 3200m, about five hours trekking. Our baggages will be carried by horses our mules. Diner and overnight at camp. Ascent= 700 m. Descent : 0. Trek to camp II (4. 2OOm), about 4 hours trekking time. Return to camp 1. Afternoon is free for preparation for next day, because we will go up to the summit.. Diner and Overnight camp. Ascent = 1100m - Descent =1100 m.
Trek to camp II (4. 2OOm), about 4/5 hours trekking time. All luggage will be carried by pack animals. A short course will be given on how to use ice-axe and crampons. Overnight camp with all meals. Ascent = 0m - Descent =1200 m.
Climb to the summit ( 5.165m) While is not technically difficult climb it does require stamina. Our ascension starts early in the morning. About at 4500 m glaciers and perennial snows are present, thus the most part of the ascent is done with equipment necessary for ice climbing. Anybody fit for high mountain walking or acquainted with ice climbing. Return to the base Camp I. Overnight at camp, with all meals. 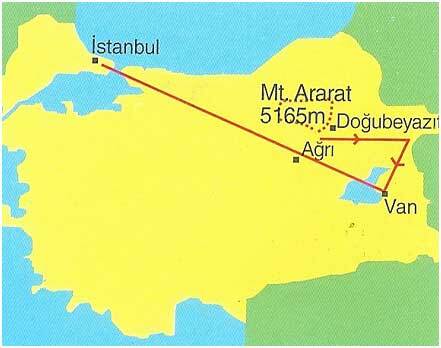 Ascent = 1065mm - Descent =2265 m.
Descend to Cevirme Village about 3 hours and return to Dogubeyazit . Driving to Van about 2h. Late afternoon free for visit city center. Depending on time we may visit Akdamar island is the most important of these. On the island stands the 10th-century Church of the Holy Cross, Architect monk Manuel built the church between the years 915 and 921.The Church, consecrated in honour of the holy cross. Reliefs, depicting scenes from the Old and New Testaments, daily Iife such as hunting, run along the exterior of the church. Overnight hotel. In the morning transfer to airportand fly home. Summits	: Mt. Ararat 5165m. 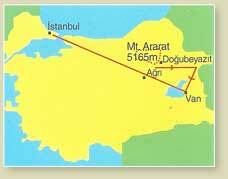 It is a requirement by Turkish Minister of Tourism to have an official permission in order to trek Mt.Ararat. We must have all participant’s names, birthdays and their passport numbers , 60 days before the departure. Therefore, please book your Mt Ararat trek as early as possible.